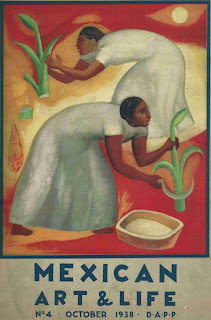 Mexican Art & Life was an English-language periodical published by Mexico’s Departamento Autónomo de Prensa y Publicidad in 1938-1939. Issues cost 15 cents per issue or 50 cents for a year’s subscription. UTSA Libraries Special Collections holds six of the seven issues published. Mexican Art & Life’s topical content is fairly consistent throughout its brief history. Most issues feature a mix of travel-guide-like promotionals about tourist destinations, articles on artistic practices or traditions, profiles of Mexican artists, and commentaries on social or economic issues, as well as occasional prose or fiction pieces. Issue No. 3 (July 1938) follows up with J. Rodolfo Lozada’s description of a trip to Yucatan, appealing to potential tourists with lines such as, “The soul of Merida imprisons and bewitches the wayfarer” and “Awaiting [the traveler] are the ruins of a civilization which, until a few years ago, only interested the archaeologist but now attract poet and philosopher alike.” Other featured sites include the Aztec ruins at Malinalco and the Iturbide Palace (April 1938), as well as Monte Alban and San Miguel de Allende (Oct. 1938). Art history topics include Oaxacan pottery (April 1938), Mexican lithographs (July 1938), Political Caricature in Mexico (July 1938), 19th century photographic portraits (Oct. 1938), and Aztec animal figurines (April 1939), among others. Artists profiled over the course of the magazine include: landscape artist and portraitist Argüelles Bringas and oil painter Francisco Gutierrez (April 1938); painter Jesus Guerrero Galvan, wax-and-fabric modeler Luis Hidalgo, and landscapist Dr. Atl (July 1938); landscapist Jose Maria Velasco and painter Federico Cantú (Oct. 1938); and photographer Majuel Alvarez Bravo and painter Agustin Lazo (April 1939). Seeming sometimes at odds with the celebratory tone and arts & culture of the rest of the magazine are occasional articles that explicitly address politics and economics. 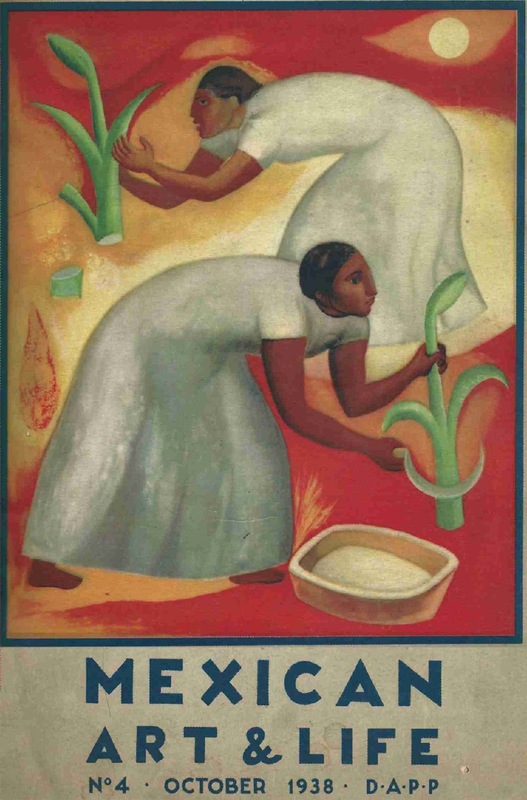 “The Moving Forces in Mexican Life” (Jan. 1938) draws on a lecture delivered by Dr. Ramon Beteta, then under-secretary of the Foreign Office” and focuses on the role of the Mexican Revolution as a social force, its development and future.